The initial controversy over Pastor John Hagee's highly public endorsement of Senator John McCain's presidential bid, at a nationally televised press conference viewed potentially by millions of Americans, arose when the Catholic League, a far-right Catholic defense organization headed by William Donahue, attacked the endorsement on the basis that Hagee was virulently anti-Catholic. Beyond Hagee's demonizing of Catholics and Catholicism, pastor Hagee appears radically anti-American to the extent that he hopes and expects, as evidenced by a 2006 Hagee appearance on WHYY's "Fresh Air" radio show and also in Hagee's 2006 best-seller "Jerusalem Countdown", that God will incinerate most Americans now living - with a nuclear strike on America's coastal regions. In 2006 Presidential hopeful John McCain appeared to hold a similar view on possible outcomes of a US war with Iran. In an April 2nd, 2006 appearance on Meet The Press, Senator John McCain, describing to Tim Russert McCain's view of the possible result of a US war with Iran, declared war with Iran "could be Armageddon". Recently it has come to light that John Hagee declared "America is under the curse of God" but Hagee has also stated that, in the war he predicts will ensue a US or Israeli attack on Iran, God might punish the majority of Americans living, immolating them in a Russian nuclear strike on America's east and west coasts. Given that Hagee has repeatedly advocated for a US and/or Israeli attack on Iran, and especially in light of enthusiastic adjectives ("thrilling", for example) with which Hagee describes the expected outcome of such an attack on Iran, it logically follows that John McCain endorser Texas megachurch pastor John Hagee hopes and advocates for a US foreign policy course that he thinks might kill the majority of Americans now alive. On September 18, 2006 John Hagee appeared on the WHYY radio show "Fresh Air", and the recorded show segment [PDF of transcript] began with an audio excerpt from one of Hagee's recorded sermons in which Hagee enthusiastically declares that envisioned chain of events he expects will follow a US and/or Israeli attack on Iran, which include "Ezekiel's War" and the "Rapture", would be "thrilling". 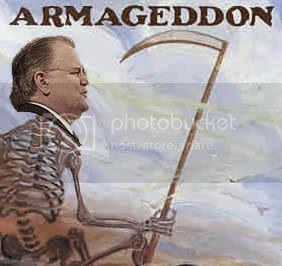 Hagee proceeded to state, in the interview with Terry Gross, that during "Ezekiel's War" that God will cause a Russian nuclear strike on America that will destroy the East and West coasts. John Hagee has further elaborated on that theme in his writings. "[W]hat is America's role [in "Ezekiel's war] ? ", Hagee asks rhetorically in his 2006 book "Jerusalem Countdown: A Prelude To War". A few pages later, on page 150 of the book, Hagee provides an answer; America's role is to get nuked by God, writing "Could it be that America, who refuses to defend Israel from the Russian invasion, will experience nuclear warfare on our east and west coasts ? That's exactly where most of us live today." [note: Pastor Hagee himself lives in Texas]. Hagee answers that question with the following: "Why would God allow this? The Bible gives a clear answer: "I will bless those who bless you and I will curse those who curse you." (Genesis 12:3). Pastor John Hagee has made defense of the current territorial borders of Israel a centerpiece of his hybridized Christian theology but defense of Israelis themselves is not. A close reading of Hagee's statements and writings shows Hagee's beliefs closely follow the mainstream view of Apocalyptic Premillennial Dispensationalism, that most Jews in Israel (and presumably along with them most non-Jews as well) will be killed in the train of events and conflicts following "Ezekiel's War". In that view, a "remnant" of Jews who have converted to Christianity, traditionally numbered at 144,000 (12,000 for each of the 12 Tribes of Israel), will survive and will be granted superhuman, divine powers to, acting as what some have termed "super Billy Grahams", to evangelize all humans who have survived the predicted global holocaust. In his book "Jerusalem Countdown", pastor Hagee states that historical anti-Semitism, culminating in the Holocaust, resulted from God's curse upon Jews, as a people, because of the ancient Jewish worship of idols described in the Bible. In the book Hagee also writes that Hitler and the Nazis were acting as divine agents, to drive European Jews towards Palestine where, per Hagee's view, God appears to demand be their only residence on Earth and where, according to Hagee's apocalyptic theological views, those Jewish settlers will be most killed in the conflict Hagee militates for by advocating an attack on Iran. In his book "American Theocracy," he regarded the resurgence of the American religious right as a sign of the country's decline. Instead of using God-given intelligence to solve our problems, the theocrats seek some sort of deus ex machina to solve our problems by somehow removing the true believers from the scene and leaving the rest of the unfortunate humans to deal with the consequences. Hagee have every right to his "theocratic lunacy" (or whatever one chooses to call it). But to the extent the media doesn't examine the package that's coming along with Hagee's endorsement of McCain, the press is not doing its job. ALL Non-Christians! How is this guy any better than Osama bin Laden? Just change their fanatic religious preference and what they want is the same thing. And the means they would use are the same. Actually, a guy like Hagee is FAR more dangerous because he doesn't have to hide in a cave, and he has some good friends (Bush and McCain) in high places. There is nothing there stating that a Zionist should be Jewish or accept them as equal or even as human. online health science degrees Let's be clear Hagee and his ilk hates (or pretend to)everyone that do not conform with his version of Christianity (and do not contribute to his coffers) and his support of Israel doesn't include the values that make Israel possible as a nation.